Listen. I was in Dallas a lot in June and July. I know they have internet there, too, but the point is that I was busy. So I missed a lot of Twitter. Through the magic of catch-up lists and Twitter showing me everything anyone I follow has ever read, I was able to pull together a tweets of the two-months club. You’re welcome. Other than that, I’m not sure we need a lot of “remember when?” context for these tweets. Which is good, because Twitter is my news and I wasn’t on Twitter as much, ergo I don’t really know/remember what all happened in the world during those two months. 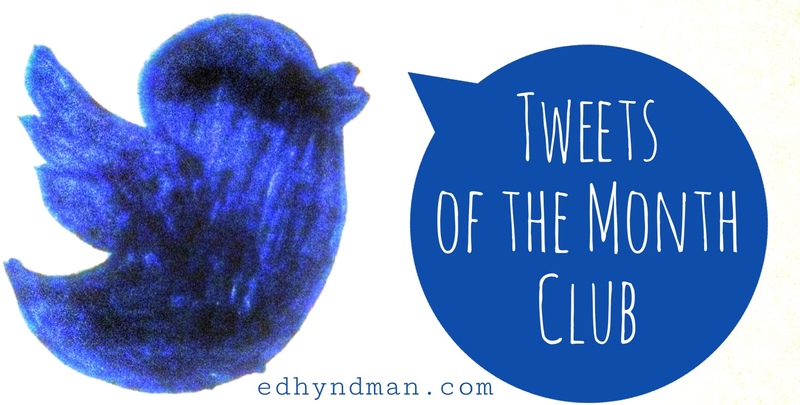 Nonetheless, here are the best tweets I read in June and July! Somewhere a husband bought some for his wife. Somewhere a mother bought some for her children. Somewhere a coworker bought some for her office. Somewhere a friend bought some for his friend. National Donut Day isn't a day. It's a revolution of love. We ain’t got time for motivational speeches. Preach the Word. Wife: I’m not sure what to do about the bookshelf situation. Me: We have too many books? Wife: We have too few bookshelves. My 3yo asks the simplest yet most-difficult-to-explain-to-a-toddler-type-of-questions. Eden: Why did Jesus die on the cross for our sins? Preston: So that we could have life. Encouragement is the art of eulogizing someone while they're still alive. My maiden name sounds like "hottie," and every time I see a wedding hashtag I shake my fist that this trend didn't exist 10 years ago. I love that feeling when you finish a really good book and you’re just kind of shell shocked by glory. I can’t wait for a long night of #SBCAM18 inagural dances! Commissioning of the @IMB_SBC missionaries at #SBC18 is amazing. “Every church plays a vital role in making disciples in every nation.” Love that we get to share in this great sending effort all together. Men who go by three names can only be one of two things: folk singers or killers. #SBCAM18 HAS ADJOURNED. YOUNG SBC LEADERS: IT IS A NEW DAY IN OUR CONVENTION. PROCEED TO THE VAPING PAVILION FOR FREE AVOCADO TOAST AND CONVERSATIONS ABOUT OUR FEELINGS. A short answer blesses fellow panelists. If you pick up your phone and see 67 text notifications, either there’s been a family emergency or your dumb buddies are making jokes on a group text and there’s no in between. Declared twitter bankruptcy for the last two days. If you had a great tweet and I missed it, know that it was awesome and you should feel validated. It’s the responsibility of the people of Jesus to take the stand of Jesus. Always. Despite the cost. We plant our feet where He’d plant His. The Gospels reveal what He was like. Our job in this world is to be like Him in this world. Social Justice Warriors? No. Actual CHRISTIANS. An online quiz just told me that bread should be my boyfriend—@BuzzFeed, as always, chillingly perceptive. Personality type: Never starts writing on the first page of a notebook because what words could be important enough for such an honor.
.@carolpipes just came out of her office to make this announcement: "I don't know why, but I have a piece of bacon in my pocket." Take yourself with a grain of salt. One quick gust & we're gone with the wind. Entrust more to Him & you'll laugh more at you. God did just fine before we got here. He'll do just fine when we're gone. Ain't nothin banked on us. One of the worst things you can possibly do is check the nutrition info on your favorite bag of chips. Alexa, handle all my confrontation. “The prophet [I think she means Pharisee] said it was bad. In suffering, hearing that God is sovereign can seem cruel. But He is both sovereign AND good. So we can trust that whatever difficulties we may have under His sovereign hand, that they are being determined and shaped by His goodness. It’s striking that unbelieving people who think I have betrayed their god have been more hospitable and charitable to me than Christian people who think I have betrayed their politics. The incivility (not to be confused with sharp disagreement) reveals idolatry in diff forms. “You see the depths of my heart and you love me the same,” is one of my all time favorite lyrics in a Christian song. Preach on, Laura Story. So if we could vote to change ours to “America The Beautiful,” I will hold the campaign sign on the side of the road. Sign of a good book: you miss the characters when you’re done reading. I’ve put a lot of credence in what Bath & Body Works says lemon verbena smells like. They could have played the longest con around and I’d never know. So, yes, I do feel entirely responsible for ending a promising chicken’s life before she was able to thrive, go to University, and make something of herself. For me personally, I know I don’t need to hear another sermon on prayer or to read another book on it for me to have a better prayer life. Because my problem isn’t lack of information, it’s pride. Pride makes me prayerless because it tells me that I’ll be just fine without it. My friends: We’re engaged! We’re having a baby! We bought a house! An alarm clock, but where your spouse’s workmates text non-stop about some tier 3 royal wedding while she is out of the room. today at dinner i had a very not embarrassing interaction with a man. Little-known Fact: The Itsy Bitsy Spider is actually a children's retelling of the Myth of Sisyphus. You know you’ve arrived as a vegetable when you’re showing up in dessert. Saw fennel ice cream on a dinner menu last night. Way to get in there fennel. If the winds and waves were calmed at His Word, your heart can be too. No matter how loud it gets or how tumultuous it makes you, be still and let Him do what you cannot. The following are from a genius thread of Bible stories told with The Office gifs. Disclaimer: I follow none of these people but laughed out loud at this thread multiple times. Okay, now back to regular programming. I’m at whatever the age is that you try really hard to remember to bring long-sleeves to the movie theater. People who oppose your views on climate change, immigrants, and other issues will spend eternity with you. Devotional reading is like chamomile tea – a soothing drink before slumber. But no one drinks chamomile tea before going to war. We need stronger drink to combat the world, the flesh, and the devil. We need battle cries as well as lullabies. We need the full counsel of Scripture. The older you get, the fewer memories you have that exist exclusively in one emotional space. Joy tinged with sadness, happiness laced with regret. Still, I love revisiting them.